Whether you’re getting back into riding after a long absence, or perhaps buying a horse for the first time, competition is a goal you may aspire to. Showing can be a lot of fun and is a good opportunity to meet other horse enthusiasts. Competitions also give you a chance to see how you compare to other riders in your discipline and to get an idea of the skills you need to continue working on at home. Keep in mind that showing doesn’t need to be expensive and high-pressure. Most horsey areas of the country offer small, unrated schooling shows. These boast a casual, friendly learning environment and a significantly lower price tag. 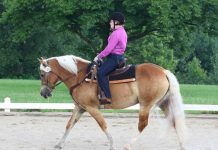 The most important thing to do when preparing to show is fine-tune your basic horsemanship skills. If you are not currently riding with an instructor, take some lessons with a reputable trainer to get you started in the right direction. Ask around at your boarding barn or talk to equestrian friends to find out about the trainers in your area. If a trainer can’t come to your barn, you may be able to go to the trainer’s facility and use a school horse. Even if regular weekly lessons are not part of your schedule, go periodically to get feedback about how you’re coming along. This will give you some areas to work on at home until your next lesson. When you feel confident that you and your horse are ready to compete, ask your instructor to recommend local schooling shows you can start out with. You can also search online, or check the bulletin boards at your local feed or tack store. Look for a suitable show that you can haul to or find transportation to easily, and be sure to send in your entry form before the closing date (if there is one). For your first show, enter a class or two at the lowest level offered. If your horse isn’t an old pro off the circuit, you will both benefit from experiencing the atmosphere and getting over nerves. Next, assemble a basic list of tack and attire required for the show. Download a free checklist here. Some schooling shows don’t require full show attire; see “Schooling Show Attire” for more info. Used tack will always help cut costs, and quality items that are well-cared for can last decades, so consider browsing online auction sites or checking out the consignment corner of your local tack shop when looking to purchase. This applies to show apparel as well. Be sure to try everything on, or be willing to return or re-sell an item if you buy it online and find it doesn’t fit. Tall English boots can be particularly expensive and difficult to fit, so give yourself plenty of time to explore both used and new options. Before hauling out to the show, pack your horse’s negative Coggins test and health certificate for travel inspection. Whether you have your own trailer or plan to ride with a friend or trainer, you’ll need some basic supplies to get you and your horse through the day. Take your cell phone in case of an emergency, and a cooler filled with snacks and drinks to avoid overpaying for unhealthy food from the concession stand once you get there. Bring a hay net and enough hay to give your horse something to munch on throughout the day. This will keep most horses occupied and happy. However, it’s still important to keep an eye on your horse at all times in case he spooks and breaks away. If you are worried about carrying water buckets long distances or your horse rejecting unfamiliar water, buy several large camping-size water jugs to fill before you leave home. This will give you an abundant water supply right at the stall or trailer, which is especially useful if it’s very hot and your horse is going through water quickly. A manure fork and muck bucket will also come in handy if you plan to stay for more than a couple of hours at the showgrounds. Some shows require that you strip your stall (if you use one) in order to get your deposit back. You may need to buy or bring your own bedding if none is provided—this is an important detail to check on ahead of time. Also, don’t forget to pack your grooming (and braiding/banding) supplies for touch-ups at the showgrounds. Bring extra leather cleaner and tack polish for a last-minute buffing of your saddle and boots before you head to the ring. Most areas with a sizeable population of English riders offer plenty of lower-level hunter/jumper shows, so those are great places to get started. All you’ll need for your horse is a hunt-seat saddle, a plain brown snaffle bridle to match your saddle, a leather girth and a shaped fleece saddle pad. For your attire, wear an ASTM-SEI certified safety helmet covered in black velvet (these should always be bought new, as a fall or years of wear will make them less safe), a navy hunt coat, a light-colored show shirt, tan breeches, black tall boots and black gloves. You can carry a short, black crop for jumping classes if needed. These items will get you through just about any hunter/jumper show. Stay away from splint boots, bell boots, breastplates or any attire that is too colorful if riding in hunter classes, although a standing martingale is allowed in over-fences classes. If you enter jumper classes, you can use open-front or splint boots, a breastplate and a square saddle pad. Jumper riders often wear polo shirts instead of coats if jackets are listed as optional. Dressage riders are free to use brown or black tack that includes a simple snaffle bridle; it is your responsibility to make sure your bit complies with the rules. No martingales or boots are permitted on the horse. For the rider, a black velvet helmet is appropriate at lower levels, in addition to a black coat, white shirt and stock tie, white or beige breeches, and black tall boots. If you plan to try eventing, start with a one-day schooling “mini-trial” if any are available nearby. Many of these events allow you to wear a polo shirt for all three phases; white or a conservative dark color usually does the trick. Paired with beige breeches, black tall boots and a certified safety helmet, you’ll be outfitted in everything you need. A specially designed riding safety vest for the cross-country phase is always a good idea, and is required at recognized shows. Braiding is often optional at English schooling shows, but you may want to try it in order to present the best possible turnout to the judge. Most jumper classes go unbraided, however, as does the cross-country phase in eventing. 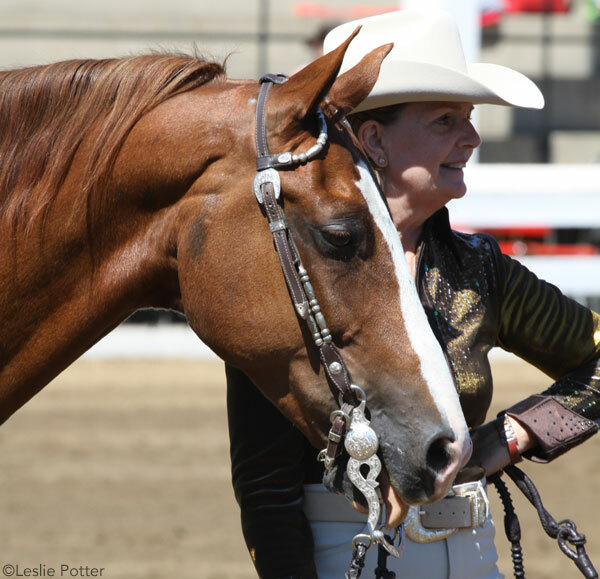 There may be someone at your barn or on the showgrounds who will braid your horse’s mane for a small fee, or if you prefer to learn yourself, check out the tutorial here. For saddle seat riders, the best way to get into competition is through academy shows. For these shows you must be a student in a lesson program, and your mount must be used regularly as a lesson horse. For academy competition, you will need a pair of Kentucky jodhpurs, paddock or jodhpur boots, a button-down shirt with a collar, a vest, a tie, and a helmet. If you want to try showing your own horse in regular competition, you will need all of the above plus a day coat, or a full saddle suit. If you plan to compete in equitation, you will need a conservatively colored suit with jodhpurs and a coat of the same color. Per United States Equestrian Federation rules, you can opt to wear a helmet in any saddle seat class without penalty; however, most riders choose to wear a traditional derby instead. There is a lot of variety when it comes to showing western. You can run barrels, try your hand at trail obstacles or compete in western pleasure. 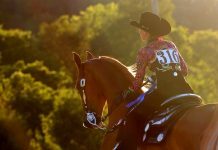 The common thread in terms of clothing is a catchy color scheme that complements your horse. For rail and performance classes, find a pair of well-fitting chaps. You might be able to borrow some from a friend at your barn, or look for a used pair online if you don’t want to pay a hefty price for brand-new ones. Choose pants that match the color of your chaps as closely as possible. Your shirt should be colorful and eye-catching but also complement your horse and chaps. Several retailers specialize in affordable show apparel, or you can go the used route. Top the look off with a clean, shaped hat. Black hats have gone down in popularity lately in favor of lighter-colored hats. Shine up your regular riding boots, or find a pair that matches the rest of your ensemble. If barrels and gaming are more your style, you can compete in your regular boots and jeans, along with a neat button-down shirt and shaped felt hat. 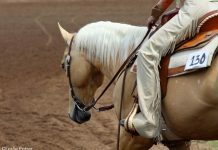 Riding shin guards may be a smart addition for the barrel racer. Your horse should be tidy and well-groomed, and your tack clean, even if you don’t have an expensive saddle decked out in silver. 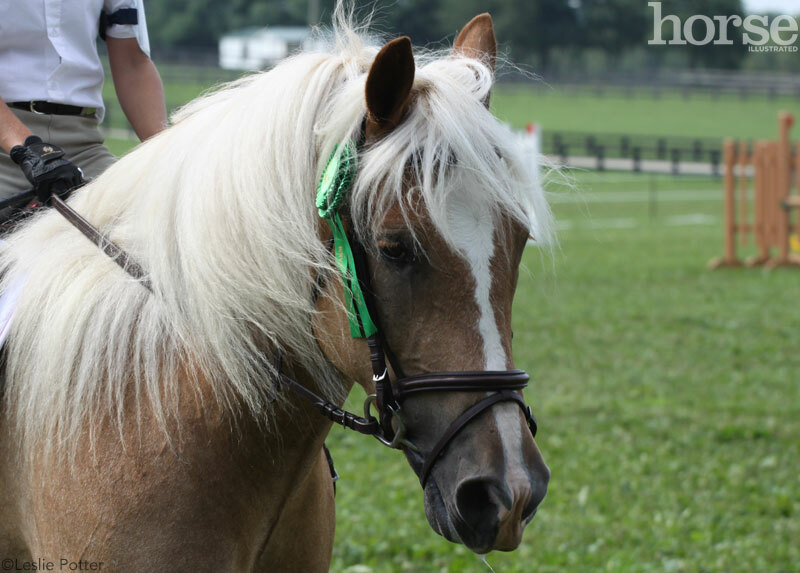 A simple, clean turnout is all you’ll need to compete at a local schooling show or play day. When you get to the showgrounds, it’s a good idea to take your horse for a walk right away so he can look around and relax. Let him hand-graze if he’s interested; otherwise, allow him to take in the sights and sounds for a few minutes. After you get tacked up, give yourself plenty of time to warm up and relax your nerves so you’re not in a hurry. Visualize yourself riding the course or pattern perfectly in your mind. If your class isn’t first thing in the morning, it’s a great idea to take a practice ride. Keep it slow and simple. Try to stay out of busy areas, and let your horse know there’s no reason to be scared. If your horse is extremely hot and excitable, take the time to longe him well before going into the warm-up arena to take the edge off his excess energy level. When it comes time to warm up just before your class, pay attention to where the other riders are and stay out of their way as much as possible. Colliding with another horse is the last thing you need right before going in front of the judge! The general rule of sharing an arena is to pass left shoulder to left shoulder when traveling in opposite directions. Do the minimum warm-up you need to prepare in order to save your best work for the show-ring. If you have a rail class with numerous other horses and riders, adjust your pace to stay out of a crowd so the judge can see you ride. Be sure to breathe, and keep in mind that you’re doing the best you can with whatever mood your horse might be in that day. Congratulate yourself for having the nerve to try showing. Who knows, in addition to you and your horse learning something, you just might find it addictive! Show Clothes Splurge or Steal? Horse Illustrated Managing Editor Holly Werner competes in three-day eventing. Previous articleBuying a Horse Online: Now That?? ?s a Gamble!